Motorola has announced that it will no longer develop the Lab Dock accessory and accompanying Webtop software, which allows an empty-shell laptop to be powered by Moto smartphones. 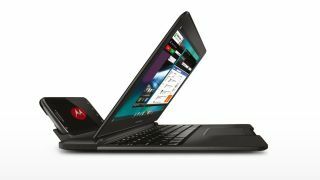 The Google-owned company said adoption of the Lap Dock and Webtop software, which arrived alongside the Motorola Atrix smartphone in early 2011, had not been strong enough to justify further development. The accessory, which was the subject of much excitement upon its debut at CES 2011, used the Atrix's processing power, memory and connectivity to bring the dock or a desktop monitor to life. As a result, Moto told CNET, the Webtop app, which appeared on its smartphones and gave Lap Dock users a separate operating system more akin to what they'd experience on a laptop, would be discontinued. The company said that, as the Android OS itself integrates more desktop-like features, Webtop would ultimately become redundant. In a statement to CNET, Moto said: "Motorola's Webtop app helps users extend their smartphone experience to larger screens. "While consumers around the world have adopted Webtop and the concept spurred a lot of innovation in the industry, the adoption has not been strong enough to justify continued resources being allocated to developing Webtop on future devices. "We have also seen development of the Android operating system focus on the inclusion of more desktoplike features. Beginning with Photon Q and Droid Razr M/Droid Razr HD/Droid Razr Maxx HD, we will no longer be including Webtop on our products moving forward." The cuts may be a result of Google trimming the fat at Motorola, following its multi-billion dollar acquisition of the hardware giant. Reports on Friday claimed that Google has already shelled-out $340m (£210m) on "severance packages" to those Moto employees deemed surplus to requirements. Overall, Google plans to cut approximately one fifth of all Motorola staff, so these hefty redundancy payoffs are likely to continue well into next year.